David, now with over 40 years of experience, works on both vintage and some of the newer manufactured condenser microphones. Working as an independent contractor, David maintains an office and a tech shop in his home in the Santa Monica Mountains. He is one of those rare individuals who really enjoys his work. Before his 20th birthday he was hooked on the music, and the industry… David started playing music at the age of 3 years old, taught by his uncle who played piano for Frank Sinatra. At age 13, he started his own rock and roll band in Rome, Italy before moving back to California at 17. He landed a job in the aerospace industry and then; he started another band. In the aerospace industry he developed a vast knowledge of electronics, production and quality control… He also received a NASA certificate in soldering and was promoted to production control supervisor at Teledyne. David was in charge of building guidance control systems, of a clean room and a fiber optics lab. During that time, he built his first recording studio in his parents’ garage in Northridge, California where he worked on his own music as well as with many other artists. 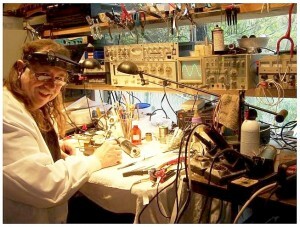 He left the aerospace industry and started a career in the music industry at Magic Wand Recording Studios in Burbank, California… There he hand built a custom 32 channel recording console with a 24 channel monitor section. Multitrack recording had only been around for a couple of years so this was a big console for that time. While at Magic Wand Recording Studios, David worked with many artists both as an engineer and a technician. David was offered a job at The Village Recorder in West Hollywood. He accepted, and during his 6 ½ year stay at the Village, he continued to hone his technical and engineering abilities while rebuilding Studios “A”, “B” and “C” and then Studio “D” where Fleetwood Mac did their “Tusk” album, and where he also installed a video studio. During his stay at The Village, he also installed Frank Zappa’s studio “The Utility Muffin Kitchen” in Laurel Canyon, and Lindsey Buckingham’s (Fleetwood Mac) studio and Rumbo Recorders (Captain and Tennille). David went on and engineered Lindsey Buckingham’s first solo album “Law And Order” and continued working with Fleetwood Mac for a number of years. During this time, he also installed a 72 input SSL recording console at Davlin Recording Studios in North Hollywood, California where he met Stephen Paul. This is when David got interested in vintage microphones and started doing repairs on vintage large diaphragm tube microphones. The old Trident “B” range console that was in Davlin Recording studios was sold to Vintage Recording Studios in Scottsdale, Arizona, where David went to install and rebuild that console and ended up there for almost 5 years working on the pre-production for Stevie Nick’s first 2 solo albums, Waylon Jennings, Willie Nelson, Alice Cooper, Mick Fleetwood’s “Zoo” and others. David then decided to leave Arizona… He returned to California where he became the Technical and Engineering Director at Cherokee Recording Studios, where there was a vast collection of vintage microphones, it was as if he had died and gone to heaven. It wasn’t uncommon to find David wearing his white lab coat in his office well into the night working on some old Neumann, AKG or some obscure microphone that looked like a shoe. He held that title at Cherokee Studios up until the day they closed their doors. In 2008, David was invited to China by a group Chinese manufacturers to help them with their quality control on some replicas of the older German type microphones. @ Copyright 2019 Microphone Repair and David Brown, All Rights reserved.